Artist's Reception is Sunday, September 23 from 3-5pm. Stop by Louisville Visual Art for a Kentucky Refugee Ministries pop-up event honoring local and international art across our city! This event is part of the We Create World Refugee Week Festival. 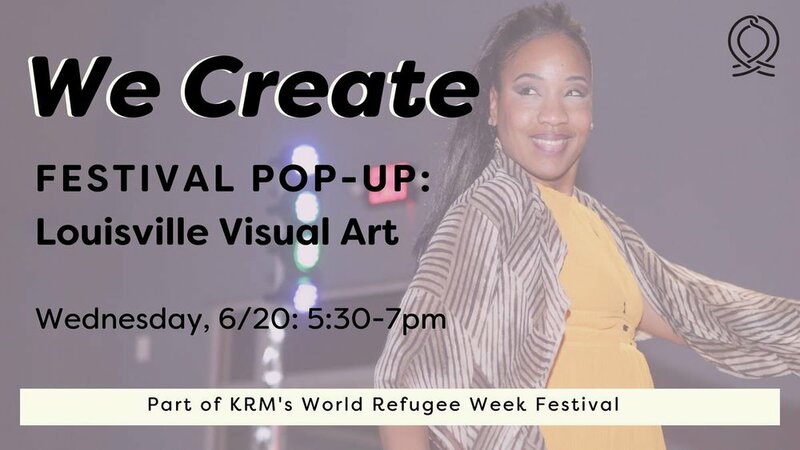 The We Create: World Refugee Week Festival is hosted by KRM as a culmination of an arts program called, 'We Create: Artists and Refugees Celebrate Making Louisville Home.' Each year, World Refugee Day is recognized internationally on June 20. Over 20 local artists will showcase their work at events throughout the week. Their work is inspired by refugee stories from KRM. Other artists include KRM alum and KRM Live performers. Stay tuned for a list of artists at each pop-up showcase. All of the pop-up events are ticketless and open to the public. No RSVP is needed. Donations are welcome. The We Create program is possible through funding partnerships with Imagine Greater Louisville 2020, part of Fund for the Arts, and the Louisville Metro Government External Agency Fund. 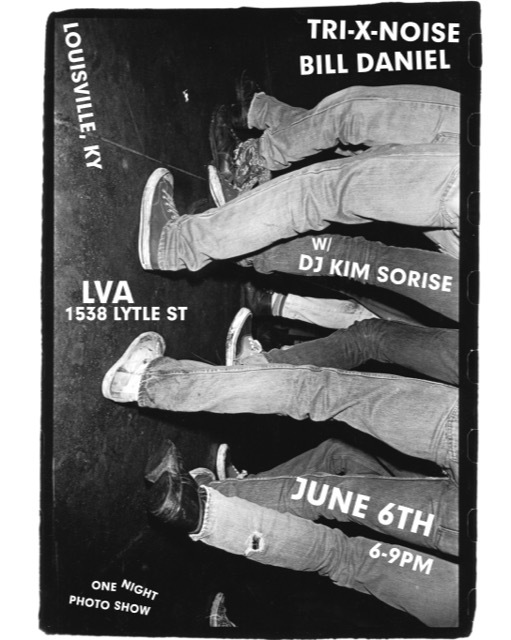 Bill Daniel book release show: "Tri-X-Noise"
Bill Daniel is back on the road with a pop-up photo show comprised of 30 years of 35mm photographs beginning with the early '80s punk scene in Texas. Daniel has continued to document various subcultures using the same camera, lens, flash and Kodak Tri-X film for over 30 years. This exhibit, all non-digital darkroom prints, charts a path starting with punk shows in Texas and crawls through the '90s graffiti scene in San Francisco, freight-hopping scenarios, art openings in Los Angeles, house shows in Louisiana, generator shows on the Monongahela River, etc., all seen through Daniel's unique spelunker flash-lit vision. Bill Daniel was a recipient of a Guggenheim Fellowship for Creative Arts and is an American experimental documentary film artist, photographer, film editor, and cinematographer. He is also an installation artist, curator and former zine publisher. His full-length film, "Who is Bozo Texino?," about the tradition of hobo and railworker boxcar graffiti, was completed in 2005 and has screened extensively throughout the United States and Europe. Gallery hours: Mondays - Thursdays from 12-4 PM or by appointment. This thrilling and vital fundraising event is held annually in early spring. More than 200 artists create 12" x 12" works of art for the art[squared] exhibition & sale, which will be available for $125 each. All artists will remain anonymous until the squares are purchased - once a piece is sold, the artist's name will be revealed. 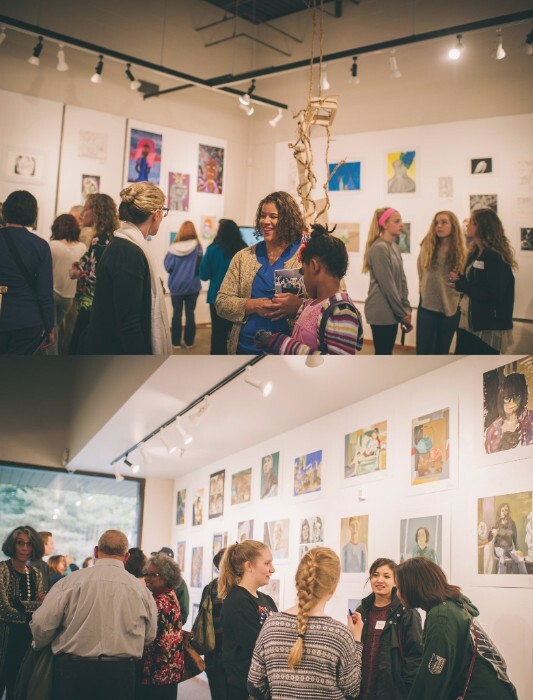 Proceeds from art[squared] support Children's Fine Art Classes (CFAC). More than 200 paintings line the walls of the LVA Gallery. Each piece is priced at $125 and signed on the back, leaving the front anonymous. The beauty of an anonymous exhibition is viewers will be able to respond to the artwork on its merits alone, without prejudice or preference. The exhibition is unseen by the public until the doors open. Guests have 30 minutes to browse the artwork and seek out their favorites. All works will be sold on a first-come, first-served basis. As each piece is sold, the buyer learns the identity of the artist, and a placard with the selling artist's name will replace the artwork on the wall. All proceeds benefit CFAC, which educates more than 1,000 artistically talented and visually driven children annually in the Greater Louisville area. This provides students with scholarships and helps offset instructor and supply costs in all 12 participating Kentuckiana counties. Buy tickets at this link online. 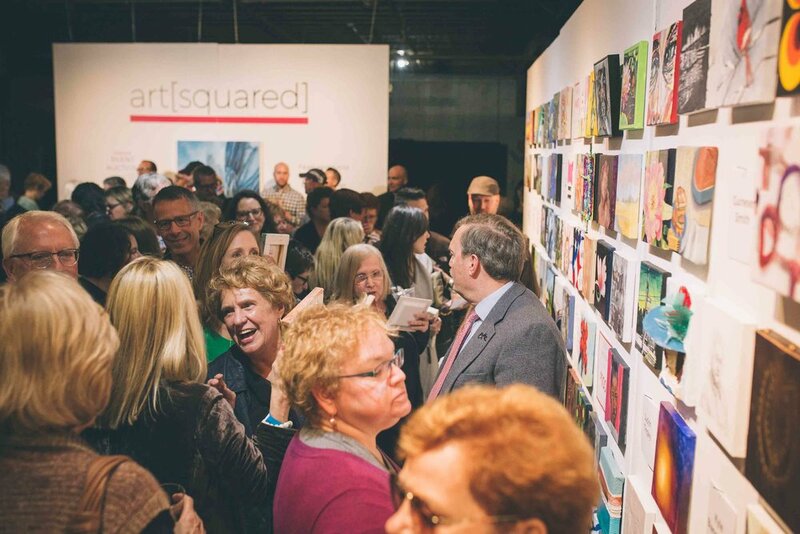 We look forward to seeing you at art[squared] 2018! Interested in becoming an art[squared] artist? Each artist is invited to submit one 12" x 12" canvas. (Canvases will be provided FREE compliments of LVA & Preston Arts Center - pick yours up at LVA or Revelry Boutique Gallery). Use the canvas to create your work in the medium of your choice! Fill out the form and sign on the BACK OF THE CANVAS ONLY! Please do not sign your name on the front of the piece - remember, it's anonymous! Drop off your completed work at a sponsoring location. Each participating artist will receive a complimentary ticket to the festive art[squared] Artists Reception & Viewing Party. Dave Caudill will be presenting photos and details of the Bolivian Odyssey project at Louisville Visual Art. In April, he was Visiting Artist at the art center Ars Natura Uta (near La Paz, Bolivia), where construction began on a large labyrinth based on a human fingerprint. He'll also discuss his proposal for a similar public artwork in the Louisville area and welcome your input! Join us for hors d’oeuvres, music, cocktails, and new artwork from Louisville artist, Patrick Donley. Patrick Donley is a longtime member of the Louisville art community who has made his reputation with his colorful, collage-based abstract paintings, compositions composed of spherical objects applied with an insistent mark-making technique. His new work explores the global connection with the game of baseball with flags serving as the visual starting point. "This series began as an excuse to use the imagery of America’s Game in my art. For years, I have been fascinated by the gritty, rugged, glorious, and often tarnished visual lexicon of baseball, a game full of heroes, heroines, legends, myths, successes and failures. It fascinates me that although Soccer is the 'World’s' game, Baseball has 'the World Series', and now, for me, that phrase finally makes a little more sense." METAMORPHOSIS is a juried exhibition and will be on view at LVA in Portland, 1538 Lytle Ave 10am-6pm, Saturday, October 8, 2016. The exhibition competition is part of the Portland Art & Heritage Fair and a production of Portland, Now! metamorphosis [met-uh-mawr-fuh-seez]: a profound change in form from one stage to the next in the life history of an organism. a complete change of form, structure, or substance, as transformation. any complete change in appearance, character, circumstances, etc. a form resulting from any such change. The Backside Learning Center, Louisville Visual Art, and Louisville Story Program invite the public to join them at the ReSurfaced Liberty Build on Friday, Oct. 7 beginning at 6:30 p.m. for the opening of The View from Back Here: snapshots and memories from the backside of the track. This is the culminating exhibit of a summer photography and oral history program for youth and young adults in the backside community who expressed interest in the documentary disciplines. Guided by instructors from LSP and LVA and made possible with a grant from UPS, they learned the fundamentals of photography and were trained in the objectives and techniques of taking oral history. They photographed many aspects of daily life on the track and conducted personal interviews with community and family members. Some of the participants are the children of equine workers on the backside of Churchill Downs, others work on the backside themselves. Together they have captured a brief, vibrant glimpse into the lives and stories lived every day on the backside of the track. 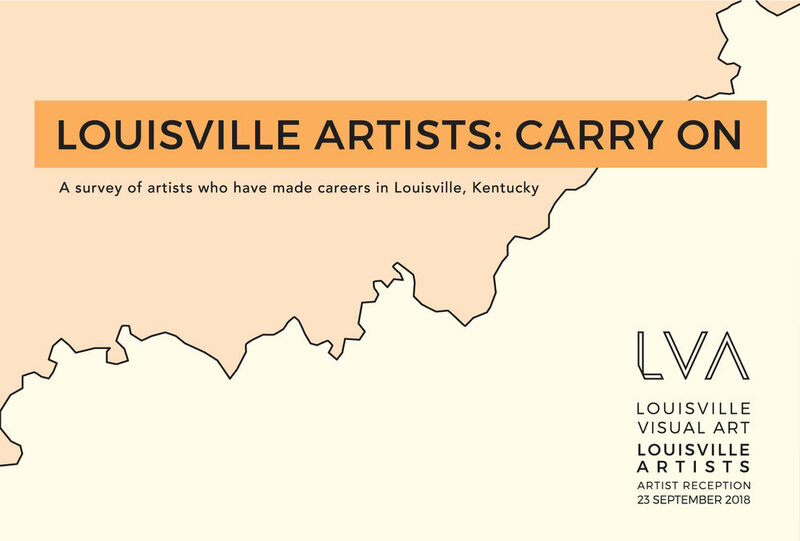 The exhibit will run throughout the month of October, Thursdays and Fridays 5-10 p.m. and Saturdays from noon to 10 p.m.
Join us for hors d’oeuvres, music, cocktails, and recent artwork from Louisville artist, Britany Baker. Learn more about Britany Baker and her work at britanybaker.com. The Studio 2000 exhibition and sale is your chance to see artwork from 18 up-and-coming local high school artists while supporting an amazing program! An ongoing partnership between Louisville Metro Parks and LVA now in its 2nd year, Studio2000 pairs high school students who aspire to be visual artists with professional artists to work in clay, fiber & mixed media. Each participant receives a $500 stipend at the end of the eight-week session. The program culminates with a public exhibition and sale on August 4th at the Kentucky Center. Proceeds from this sale are recycled through Studio 2000 to support future programming. Images provided by Ezra Kellermen. iii Spring Meet is a live art competition where individual artists have two hours to spontaneously construct a work of art using only ten mystery items! Each participating artist will choose one of ten the mystery items used in the competition— keeping the item secret until the competition begins. Winners are chosen strictly based on audience voting, and will receive $1,000 in cash prizes. This year's Instant Installation Invitational will include a group exhibition featuring artwork from each of the participants. A select artwork from each artist will be raffled off after the culmination of the live art competition. Audience members will have the opportunity to purchase raffle tickets during the event, and proceeds from the raffle with benefit LVA, Instant Installation Invitational, and the artist responsible for the work. Artists competing in iii Spring Meet include: Julie Leidner, Andrew Cozzens, David Metcalf, Teresa Koester, Shohei Katayama, and McKenna Graham. Doors open at 5:00PM and the competition begins at 5:30PM. The drawing of the raffle as well as the competition awards presented at 8:00PM. iii Spring Meet is free and open to the public. It's that time of year again, folks! We invite you to contribute to Louisville Visual Art's (LVA) 4th Annual art [squared] Anonymous 8" x 8" Art Sale. This thrilling and vital fundraising event will be held on Saturday, April 9, 2016, from 10am–1pm at LVA's new location, 1538 Lytle Street in Portland, and most importantly, it will raise funds for LVA's Children's Fine Art Classes (CFAC) program, which educates over 1,000 artistically talented and visually driven children annually in the Greater Louisville area. 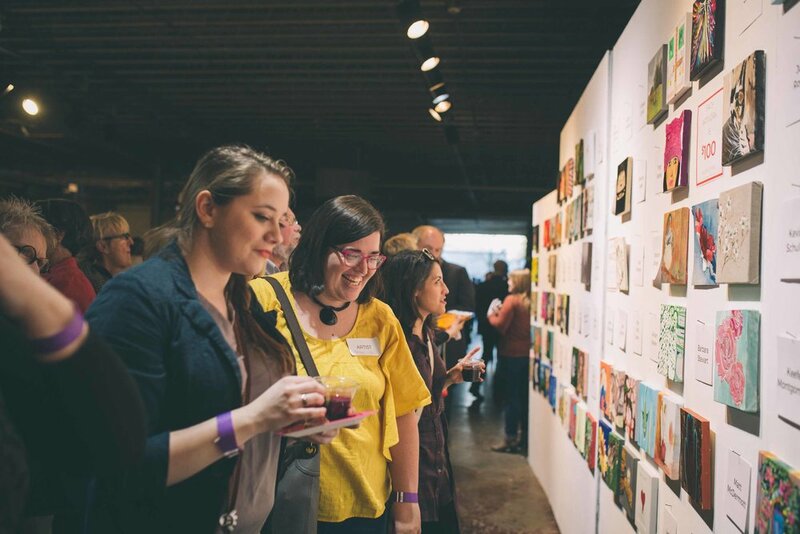 Last year, we were able to raise over $24,000 during art [squared]! This provided students with scholarships and helped offset instructor and supply costs in all 11 participating Kentuckiana counties! Carrie Burr's solo show Context Of Unraveling will be on view at Public Gallery for the Louisville Photo Biennial, October 2015. To experience life through the eyes of a dancer is a rare treat. Wendy Whelan’s photography exhibition encompasses uncommon sights and vantage points that will be entirely new to most viewers. Using the mobile platform Instagram (@WendyW), Ms. Whelan captures moments from the secret side of the dance world not usually revealed to the public from her own unique perspective. The images within this exhibition were initially the inspiration for a larger gallery of photography taken by Ms. Whelan as well as a number of other well-known dancers in the field. The original exhibition of dancer photography, Shooting Stars, which was on view at Jacob’s Pillow Dance Festival in Blake’s Barn during the summer of 2013 was curated by Norton Owen, Jacob’s Pillow’s Director of Preservation. As she continues to develop her creative eye for photography, Wendy Whelan shares her artistry on a day-to-day basis with her 17,000+ followers on Instagram.